By Scott Gilfoid: British heavyweight David Price (23-6, 19 KOs) will be fighting next month against unbeaten Kash Ali (14-0, 6 KOs) in a 10 round fight on March 30 on the Liam Smith vs. Sam Eggington card LIVE on Sky Sports at the M&S Bank Arena in Liverpool, England. 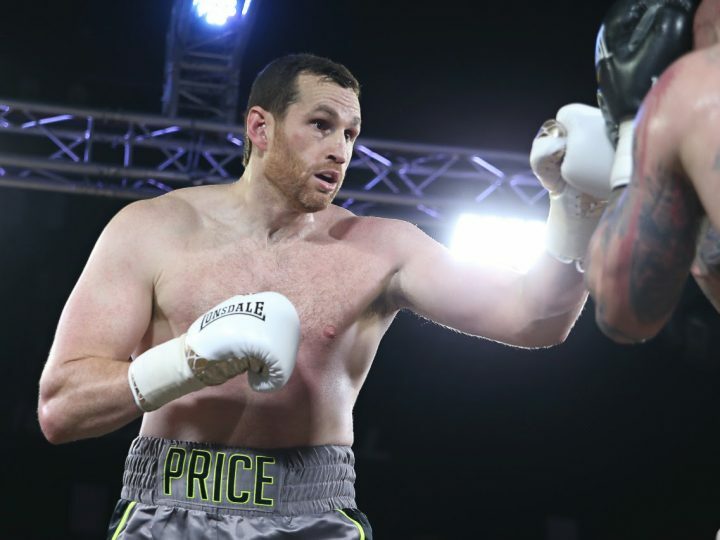 Price, 35, will be looking to pick up his second consecutive victory after beating journeyman Tom Little (10-7, 3 KOs) by a third round knockout last December at the O2 Arena in London, UK. This is a fight that the 6’8″ Price hopes will evetually take him to a bigger fight. Price isn’t saying it, but he would obviously love to get a world title shot against IBF/WBA/WBO heavyweight champion Anthony Joshua or WBC champion Deontay Wilder. Price’s problems in the last six years of his career would preclude him getting a title shot against Joshua or Wilder at this point. But if Price can beat enough of the guys that Matchroom Boxing promoter Eddie Hearn puts in front of him, he could potentially get a title shot against one of those two. It would take a miracle though for that to happen. With Price, his career has gone in a herky-jerky manner with him winning two or three fights, and then getting knocked out by the likes of Christian Hammer, Sergey Kuzmin, Alexander Povetkin and Erkan Teper. Price is going a little overboard in describing Ali as “dangerous fighter.” If Ali was that kind of a guy, he wouldn’t be still fighting fodder oppsition after eight years as a pro. The management for Ali should have stepped him up against better fighters eons ago if he’d shown a spark of talent that would give the indication that he could compete. This is a winnable fight for Price as long as he doesn’t get clipped by one of Ali’s shots. Ali isn’t a big puncher, but as we’ve seen in Price’s stoppage losses to Tony Thompson, Teper and Hammer, that he doesn’t to neccessarly be facing a big puncher for him to be knocked out. Price’s punch resistance has proven to be limited during the last six years of his career. It would be in Price’s best interest to go after Ali with heavy artillery from the first round on March 30 in order to make sure he doesn’t get a chance to land something big later on. It’s not just Price’s chin that gives him problems. It’s stamina or lack thereof. When Price gasses out in his fights, he’s vulnerable to getting knocked out by anybody. Price’s knockout losses to Tony Thompson [second fight], Hammer and Povetkin were directly related to him fading badly in those fights. This is another one of those fights where Price cannot afford to lose if he wants to keep his career going. Losing to the likes to Povetkin, Kuzmin and Hammer is excusable, since those are world class guys. Those guys aren’t great fighters obviously, but they’re at least top level heavyweights. Kash Ali is more domestic level at best, and he’s not someone that has shown the kind of talent that he’s going to one day climb his way to a top spot in the heavyweight division, even with the softest match-making. Price can’t lose to Ali if he wants to get the big fight that he’s dreaming of against one of the top heavyweights. Price doesn’t say who he wants to fight, but it doesn’t take a genius to figure out that he’s hoping to hit it big by getting a fight against the likes of Joshua, Wilder or Dillian Whyte. Those would all be mismatches at this point, and it’s hard to imagine Price even getting any of those fights. The problem is that even against lesser heavyweights like Kash Ali, Price is at risk of losing. If Ali take the fight past six rounds, he’s going to have Price at his mercy, and he could knock him out with a jab. Price’s loss to Hammer was more of a situation where he was so tired that he could do was hang over the ropes. The referee had no choice but to stop the fight. Hammer was’t doing much at the time to get the stoppage. it was a situation where Price exhausted to the point where he was going to keel over on the canvas. He looked in horrible shape in terms of his cardiovascular system.